When it’s time to leave Hawaii, it probably doesn’t make sense to bring an island beater with you. Cars litter Hawaii, quite literally. When visiting the islands you’re likely to see abandoned cars on the road, in fields, in ditches, and sometimes even ablaze. Hawaii is full of transplants that ship their vehicles from the mainland — including myself. It’s not uncommon to hear stories of how a transplant lived out of their car for “x” number of days/weeks/months upon their arrival in Hawaii. It’s a lifeboat, and practically a right of passage when moving to the islands. As time passes, the vehicle gets older and depreciates. After some years, it’s affectionately referred to as an “island beater.” Island beaters are full of sand, salt, rust and used to transport surfers, boards and wet dogs from one remote surf spot to another. Hence the name, they take a beating. A torched van I passed while riding home on my scooter. Whether it’s after 2 years or 20 years, the vast majority of Hawaii transplants eventually leave. When a transplant leaves Hawaii, it’s often economically infeasible to bring their island beater back to the mainland. Ideally, they would sell it before leaving, but that’s easier said than done. Selling a car requires 3 documents — a registration, safety inspection and title. Acquiring and keeping these documents up to date is difficult, expensive and time consuming. Obviously, it shouldn’t be. However, it’s easier to paddle the Molokai channel than deal with the Hawaii DMV. Most states make it easy to register your vehicle. They go out of their way to inform you that it’s time to renew. Hawaii is too laid back for that. They don’t tell you Jack Schitt. Since there is no passage of time here, only endless sunsets and sunrises, remembering to register a vehicle tends to slip the mind. Hawaii is Neverland after all, and Neverland makes you forget. The cops couldn’t care less about registrations. Especially since Taguma retired from the force. I have friends that have gone years without renewing and never received a ticket. In the unlikely scenario that you actually do receive a ticket, the fine is around $100. When compared to the absurd $300 yearly cost of renewing a vehicle registration, most locals take their chances with tickets. However, after a few years of failing to renew the registration on your island beater, a decision to move from the islands can leave you with $1,000 worth of registration renewal fees. Of course, this could all have been avoided by setting an annual reminder, but moving to Hawaii isn’t about responsibility. Safety inspections are mandatory in Hawaii. When a vehicle registration is out of date, the safety inspection probably is as well. Now it’s time to play ping pong with the DMV and a safety inspector. You can’t get a registration renewed without a valid safety inspection, and you can’t get a safety inspection without an up to date registration. WTF! Getting a safety inspection for an island beater is risky. You pay a cool $15 for the inspection on the hope and prayer of getting that damn little sticker to slap on your red dirt covered bumper. However, the $15 inspection cost is like paying a dentist for an exam — they’re probably going to find something wrong. Safety inspections are performed by mechanics, and mechanics make money off repairs — not inspections. So, guess what’s going to happen? You’re going to be replacing tires, fan belts, fluids or something else on your car that costs a lot more than 15 buckaroos. My vehicle has been paid off for over 5 years. I need the title to sell my vehicle. Honda never released it to me. Months of going back and forth with the DMV and Honda — using fax machines. Who the hell still uses fax machines? I don’t know how to operate those archaic pieces of technology. You might as well hand me an abacus. Anyway, the DMV informs me that I need to renew my registration in order to obtain my title. I try to renew at the DMV, but need a safety inspection. The safety inspector won’t pass my preliminary inspection without all new tires. A thousand buckaroos, gone. With my new tires, I get a temporary inspection card that lasts 30 days. I take that to the DMV, and I’m finally able to renew my registration. Another $300 dollars, gone. I go back to the safety inspector for my final inspection. He can’t pass the inspection — again. This time, because my insurance card from Allstate has expired — literally, the day before! So, I go to the nearest Allstate office and have them provide me with a temporary card. I take it back to the inspector, and finally get that damn sticker! I’m golden. I’m finally gonna get that title! I go back to the DMV, for the hundredth time. They know me there. I’m told Honda failed to notarize the form. Now, I’m waiting on the Honda Finance Corporation to mail the final document I need to obtain my title… maybe. Probably not. If you can sympathize, it’s not a giant leap of the imagination to see why people ditch their car in Hawaii. Should the required documents to sell your vehicle be out of hand, you’re faced with a dilemma. You can spend weeks, maybe months getting your documents in order, and potentially thousands of dollars in fees and repairs on an island beater that’s only worth a few thousand. Or, ditch that sucker in a field, light a match and buy a one-way ticket to the mainland. If I had it to do all over again, I might just put my car in neutral and push it off the Pali. I thought about donating the car to the Maui Humane Society or a food drive organization. Think again! You can’t even give away a car without a title! So, that’s my theory as to why there are so many abandoned cars in Hawaii. I think it’s a sound theory. It’s obviously a problem. Maybe the root of the problem is that there are too many haole transplants like myself in Hawaii. I’m entirely capable of admitting that, but I’m not burning my car yet. I’m sure the state spends thousands upon thousands of dollars towing and disposing of these vehicles. So here’s a kind request to Governor Ige, please make it a little easier and less expensive to renew a vehicle registration. I’m sure it would be greatly appreciated by all Hawaii residents. 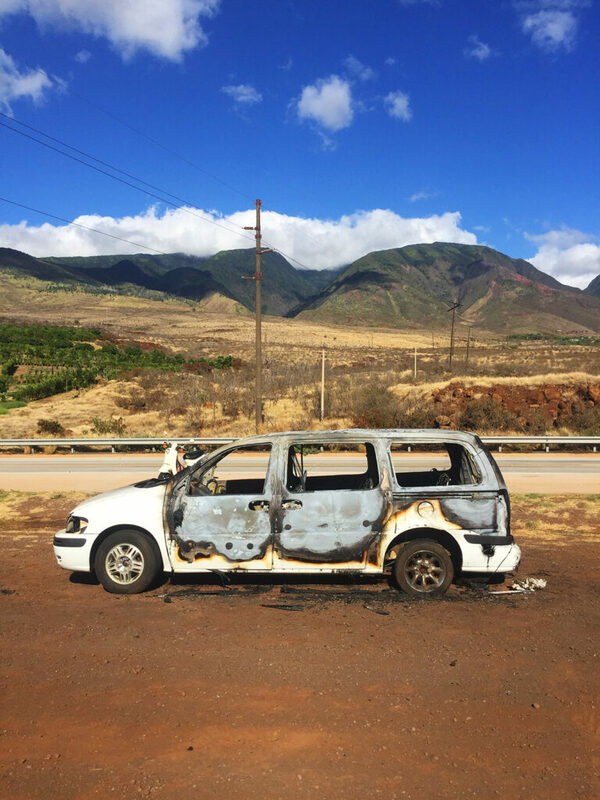 I just visited both Kona and Oahu and was amazed at the broken cars down, especially Oahu. Shame on that island with all the tourism money they get. Kona has very good roads and was cleaner, but I have to say the policies must not be correct when I saw an upside down sedan in a drain ditch. We had stopped and went in car to see if any one was injured or needed help, along with other locals. No one was there but to make matters worse the car had been liked that for three days. I can’t imagine how many people stopped to look and check since that time. To me that’s just irresponsible and dangerous to leave an abandoned wrecked car like that. Too many tourists and good hearted people are going to get injured looking to see if people are ok.
Something needs to be done about policies on car desposal and of course accidents. I was once threatened by a criminal who was taking apart a car over by Kahana Bay on Oahu. This is a serious problem. Almost once a week there is a car set on fire. I was in Oahu last week and I also witnessed all the abandoned cars.not to mention all the homeless with the makeshift tents. I was in the Navy 1975-1977 the island was beautiful. I feel bad for the people who put this government in there. There regulations are not helping this state at all. I will not be going back. Hopefully some day it will get turned around but I doubt it. We are on Oahu right now. Driving around the island it is amazing how many vehicles are on the side of the road broken up with no tires. It seems to me that the tow companies are leaving these cars on the side of the road after they take off all the good tires and parts they need. One of the big problems on the island is the tow companies are towing so many cars they have no room in their lots for storage. Best way to solve that problem for them is to move the vehicle somewhere else. We were in a subdivision the other day and two vehicles had been dumped right in the middle of all these occupied houses. Sad thing is that the people of Hawaii keep electing the same nuts to ruin their government. So sad. I’ve asked the same question here on oahu and a year ago on maui. Why don’t the islands have designated car shredders/crushed and prepare the metal for recycling? Same thing with garbage. This is supposed to be paradise and we, as travellers bring millions, if not billions of dollars to the islands annually. There is no excuse in my opinion. If gov’t can’t handle it, private industry and residents need to take responsibility. 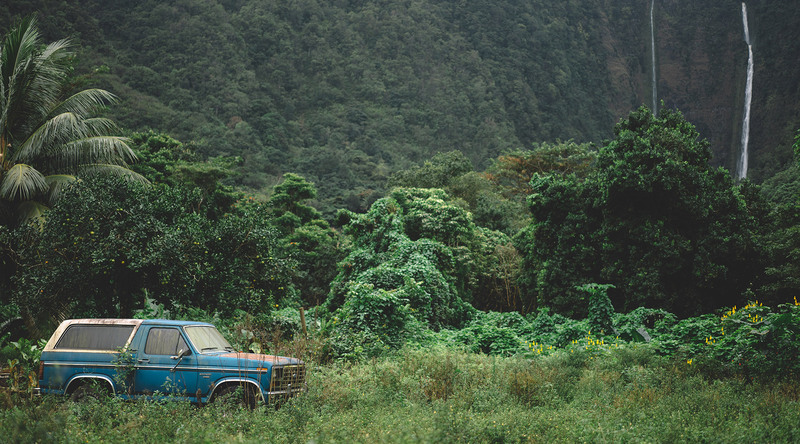 We are staying in Oahu now and could not believe the large amount of abandoned vehicles left throughout the island. This is my first time to Hawaii and I was shocked to see this. What a beautiful island littered with broken cars. I live in Idaho and if a vehicle is abandoned it would be tracked by the VIN to the owner and they would be heavily fined AFTER the vehicle was removed. Something needs to change here. Iam from Detroit gorgeous Island. With more garbage broken abandoned cars and homeless people living in tents and shanties than there are in Detroit. What a shame. Something should really be done it will eventually hurt the tourist industry. Just my opinion. 1st time to Oahu probably last. It’s a pity you don’t have a donate button! I’d most certainly donate to this superb blog! I suppose for now i’ll settle for bookmarking and adding your RSS feed to my Google account. I look forward to brand new updates and will share this website with my Facebook group. Chat soon! I tried to get information on how to adopt an abandoned vehicle from the DMV today, and I was basically told you have to have a title. The cars in question are a 1975, and 1976. they have been abandoned on someones property for 10 years. The person is obviously not interested in getting back their two rusted chassis with no motor, or transmission. I however want to give them a new life as electric vehicles. They say the VIN numbers are not in their system. They won’t issue even a salvage title. The system is broken. Great article. Dmv on Maui is an experience everyone should have at least once in their life. It will test your sanity. Hard to believe we can operate this inefficiently in these modern times with aboslutely now emphasis on customer relations. When someone obviously abandons a vehicle,scooter, motorcycle the emphasis should be getting it back on the road if someone is willing to make the effort. Give them a title already. No one including the government agencies can make money from garbage sitting all over the island abandoned. Failing governance and a one party system is a third world society. A billion dollar rail system over budget also tells the story. It can’t be that difficult to solve this problem but apathy and a one party system causes ineptitude. It is starting to look like Mexico. dont vote for any politicians born in Hawaii and only vote for politicians younger than 30. youll guaranteed to see big change, more accountibility. Today local Hawaiins politicians who are born in Hawaii are useless , they know how to over charge and steal from the taxpayers of America. To the Tent city, charge them with huge fines and jail them in Alaska. Thats how the problem is fixed. A stolen car check gives the vital data you can use to guarantee, that the vehicle expected to be purchased is not stolen. Like other stolen merchandise, a stolen car will no doubt have all the signs of being impeccably real. a Caranalytics Vehicle History Check you can detect a stolen vehicle, before chaos ruins your peace of mind.